Mark McGhee has advised Ross McCormack to bide his time after the Aston Villa striker suffered a double snub from Scotland manager Gordon Strachan. McCormack was omitted from the original squad of 27 players for Sunday’s opening World Cup qualifier with Malta, which was surprising news in itself. But eyebrows were further raised when on-loan Hearts striker Tony Watt was preferred to McCormack following Leigh Griffiths’ withdrawal earlier this week due to a hamstring injury. McCormack, who missed his own stag party to play for Scotland against Italy in May, joined Aston Villa from Fulham for £12 million. This move took the aggregate sum of his transfers to nearly £24 million. But McGhee, the Scotland assistant manager, stressed such large figures have no bearing on Strachan’s thoughts. He referred to the case of Oliver Burke, who has become Scotland’s most expensive ever player since the squad was named. Burke was included in the squad before he made headlines after completing a £13 million move from Nottingham Forest to Red Bull Leipzig. McGhee stressed there is no agenda behind McCormack’s exclusion. He is a long-time admirer of the player, who excelled during his first spell as Motherwell manager. But it is not just McGhee who the striker needs to impress now. 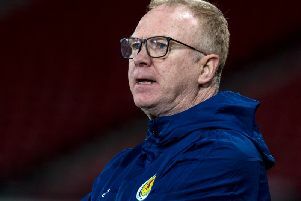 The 30-year-old must catch the eye of scouts such as Andy Ritchie and newly appointed coach Andy Watson as well as Strachan himself. “There is no bigger fan of Ross McCormack than me,” said McGhee. “From day one I have promoted Ross from when I first saw him at Motherwell. But what Gordon has done is sit down in the summer and draw up a list of 45 or so players we made sure we would be looking at and scouting. We have had Andy Watson, Andy Ritchie and myself at times. Gordon, of course, and others have been out at games watching all those players so that we have done our due diligence. And then, when it comes to the squad, Gordon picks 24.